I read this article and found it very interesting, thought it might be something for you. The article is called India’s Right To Education Deadline Comes & Will Go and is located at https://archive.indiaspend.com/sectors/indias-right-to-education-deadline-comes-will-go. A deadline set by India’s Supreme Court for all states to meet the Right To Education (RTE) Act goals by March 31, 2013 is expiring now. Which makes it a good time to ask: how far are the states from achieving the targets? India introduced the RTE in 2009 to ensure that every child, in the age group 6-14, gets free and compulsory education. Some RTI highlights include permanent classrooms, separate toilets for boys and girls, electricity, drinking water, library, playground, a teacher per 30 students in elementary level, and every teacher to be professionally qualified. The cost is to be shared by the Centre and the State Governments. Let us look at data from District Information System For Education (DISE) 2011-12 to get an idea of the RTE performance of a few states. DISE is compiled by National University of Educational Planning and Administration (NUEPA) that deals with capacity building and research in education. So, we can see that Bihar is set to miss almost all the targets set under the RTE Act. We will look at what really ails Bihar’s primary education system in the later part of the article. IndiaSpend had earlier reported about the drawback in the implementation of the scheme. Here we look at a few data points based on the recent available reports. 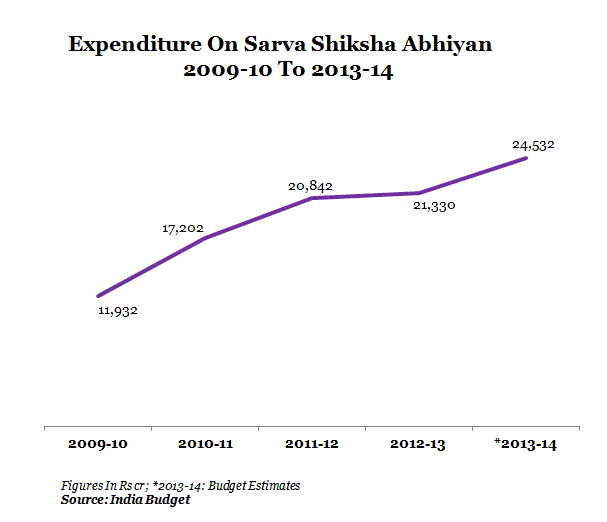 First, a look at the Budget allocations for Sarva Shiksha Abhiyan(SSA) since 2008-09 to 2013-14. 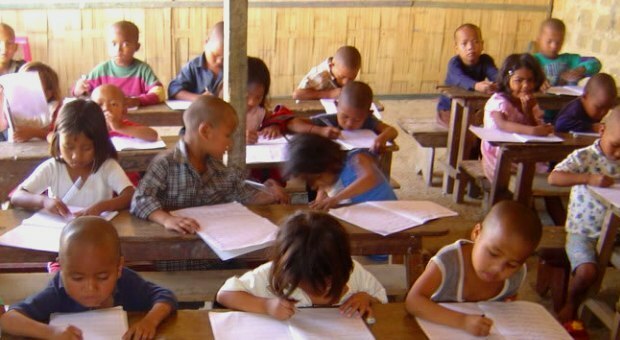 SSA is the name of the programme that’s driving the implementation of the Right To Education Act. From Figure 1, it can be seen that SSA spends from 2009 to 2013-14 is Rs 95,838 crore. And expenditure has jumped since the implementation of the RTE. The total budget for Department of School Education and Literacy stands at Rs 52, 701 crore in 2013-14 out of which SSA takes Rs 24,532 crore and Mid-Day Meal Scheme gets Rs 11,892 crore. Around Rs 16,277 crore is divided among all the other heads of expenditure like Rashtriya Madhyamik Shiksha Abhiyan (RMSA), a scheme for setting up 6,000 models schools, merit scholarships and adult education. IndiaSpend also looked at the 2012 PAISA Report, a national-level school survey published by Accountability Initiative, a Delhi-based think-tank that tracks government programmes to see where the SSA money goes and where are the problems in Bihar as well as other states. Interestingly, the spending priority of Sarva Shiksha Abhiyan, according to the PAISA Report, is teachers followed by school infrastructure and finally children (including entitlements, mainstreaming out-of-school children and remedial teaching). The PAISA report says that around 26% schools remained without any type of grants (maintenance, development, teacher material) in the year 2011-12. Around 90% schools spent maximum money on buying chalks, dusters and registers in 2011-12 while only around 38% schools spent money on crucial RTE objectives like infrastructure, drinking water and toilets. The highest RTE shortfall is in having a complete boundary wall followed by lack of headmaster’s office. Surprisingly, the headmaster’s office shortfall had increased from 31% in 2010 to 34% in 2011 but the report does not more any more details. The lowest shortfall has been reported in drinking water facilities. Similarly, there is improvement in availability of library books and provisions for separate toilets for girls. Interestingly, Bihar’s schools spend most of their money on purchase of chalk/duster/register, teaching material and school events as against purchase of electrical fittings, construction of boundary walls or repair of toilets. 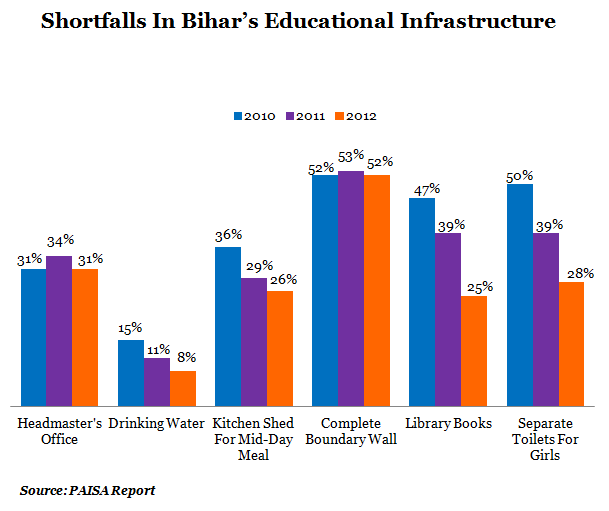 While all schools in Bihar had received almost 80% of their grants, expenditure has been around 40% in 2011-12. So, while Bihar is still far way from meeting the RTE objectives, other states, too, are set to miss the Supreme Court directive. Fantastic Data. Very useful for me. I would like to congratulate you for this paper. I just have some queries. The biggest one is that how did you get the data that till 2013 the total expenditure via RTE Act is 95000 crores.